"Mommy, let's buy an angel fish." "Daddy, I want a bunny...now!" "Mommy, let's get a new doggie and I'll name him Buster." The kids actually said those words. Since we moved to our current abode two years ago, with our pet poodle in tow, our home has never been lacking of some friendly creatures of all shapes and sizes. SUSHI. Our first family pet. He is a red toy poodle. I was really happy that my children got introduced to Sushi at an early age. Well, it was actually the other way around -- Sushi was already with us when the kids were born so it was a bigger adjustment for him! (",) Being with a dog took out some of the fear from the kids when they encounter other animals. And he proved to be a very sweet and lovable playmate for the tykes. Sadly, Sushi went on to dog-heaven just before new year's day. He was with us for 8 years. RED, the Fighting Fish. And RED-2. 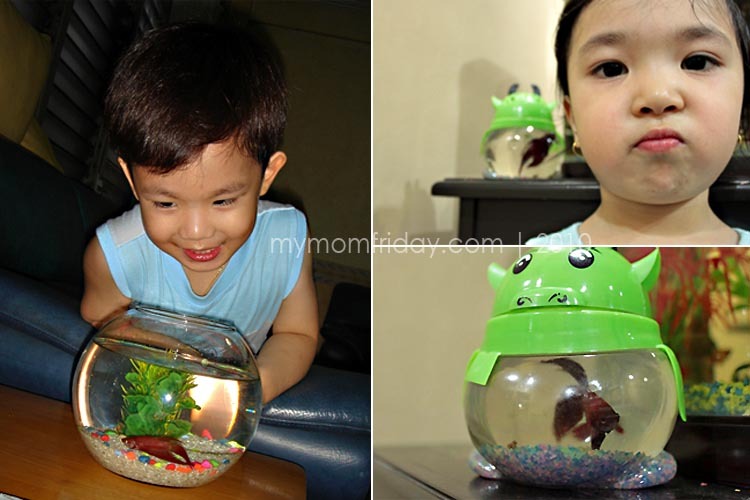 My boy was almost 3 when got his first pet fish in 2006, a giveaway from a children's party we attended. He loved it! It was a deep red fighting fish and it came with it's own fish bowl. For obvious reasons, we named him by his color. He never missed peeking in the bowl and enjoyed feeding it fish flakes and breadcrumbs. Red went down the toilet after a year and a half. Red-2 was for the girl. She got it from my sis-in-law before her 3rd birthday party. It only lived a couple of months. We also had several tropical fishes that came and went. HERMIT Crabs, Big one and Small one. SKYLER and RENEE, the bunnies. 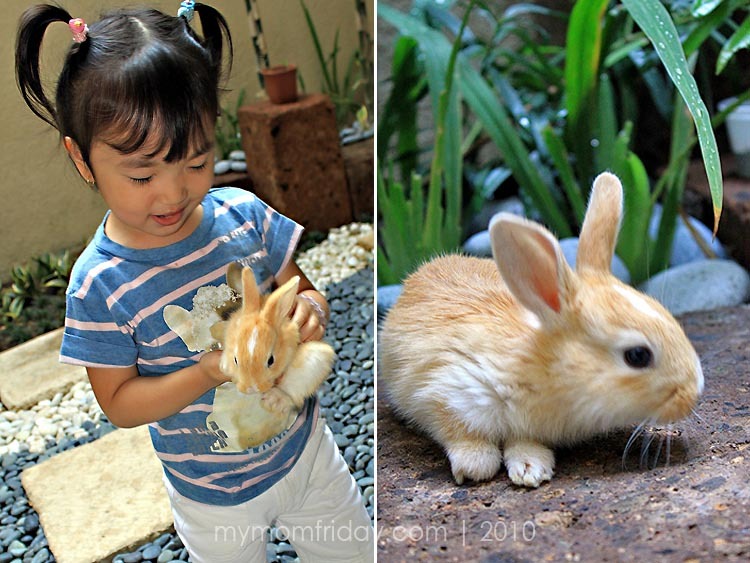 Meet Renee, the brown 'boy' bunny, and the white 'girl' bunny named Skyler. The kids insisted on the gender-bender names. 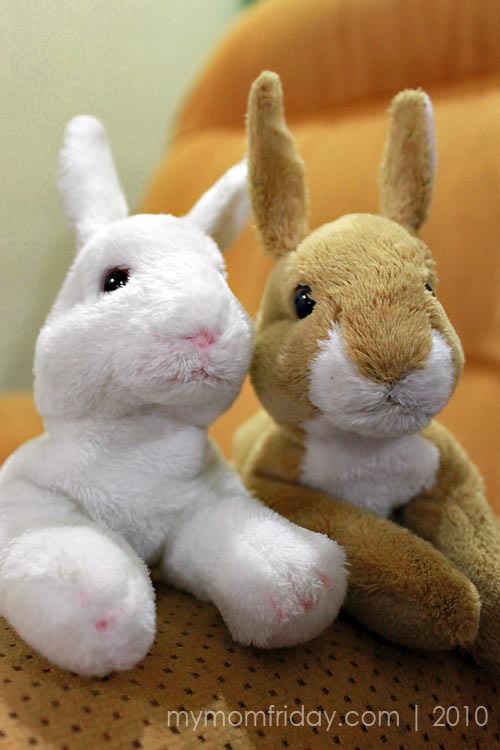 These super cute and cuddly hoppers are their current 'play things'. 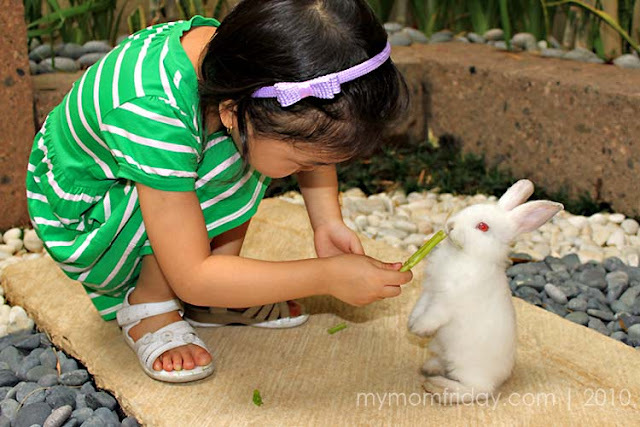 I think it was due to my husband's influence that the girl was nagging me to buy her a bunny after her fish, Red-2, "got sick and died". Note the print on the blouse of my girl. I was hesitant at first. I was just not ready to take care of another walking animal. 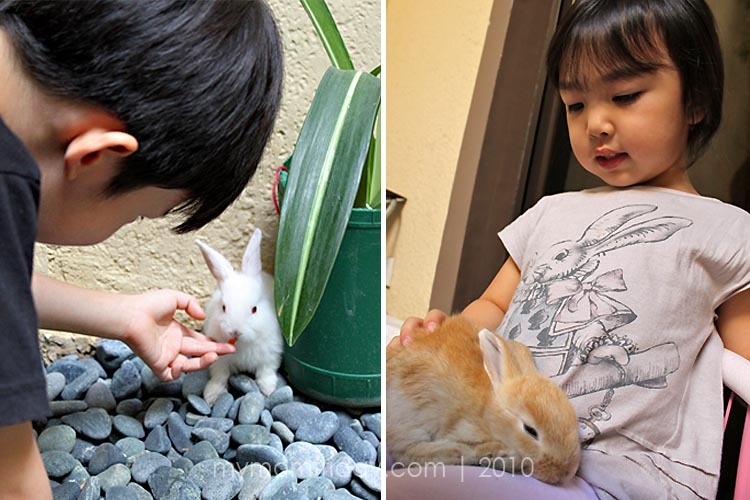 But hubby had pet rabbits when he was younger so I trusted him to know more about caring for these adorable creatures. We got the pair last April. These bunnies proved to be so irresistible, especially for my girl who loves to feed them with green leafy veggies. But no luck for her brown bunny Renee (4th photo), who did not last a month. We suspected diarrhea. 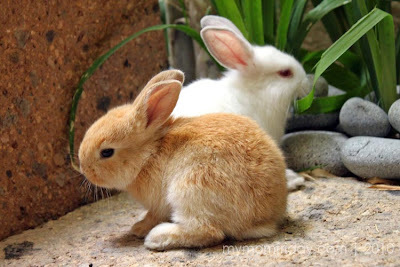 Bunny rabbits need companions, and so no time to grieve. He was quickly replaced. Here's Renee-2, a look-a-like (below) with a white streak on his head. This one also croaked after a few weeks! We're still figuring out if the white bunny, who's grown bigger now, has anything to do with these series of unfortunate events. In the meantime, no replacement for Renee-2. Cost of caring for the chosen pet - food, shelter/cage, bedding, toys, vet, etc. Time you can spend with the pet - time to feed, to play and interact, to groom, to clean cages, etc. After a poodle, tens of fishes, a pair of crabs, and brown bunnies, we are now left with two algae eater fish, and a lone white bunny...for now. If live animals are not your thing, then the stuffed ones can still deliver some cuddle factor. Aren't they cute? Stuffed replicas of Skyler and Renee that the kids go to bed with. What's your pet? Or are you ready for one? 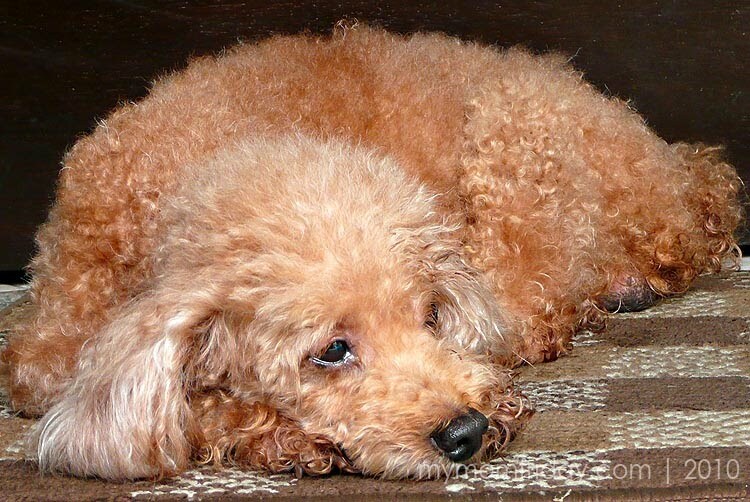 You may also want to read my dedicated post for our late poodle Sushi here. 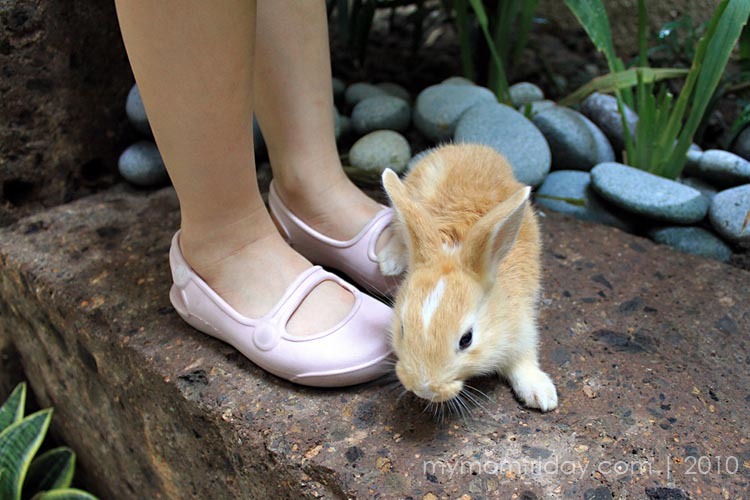 More about rabbits as pets here. 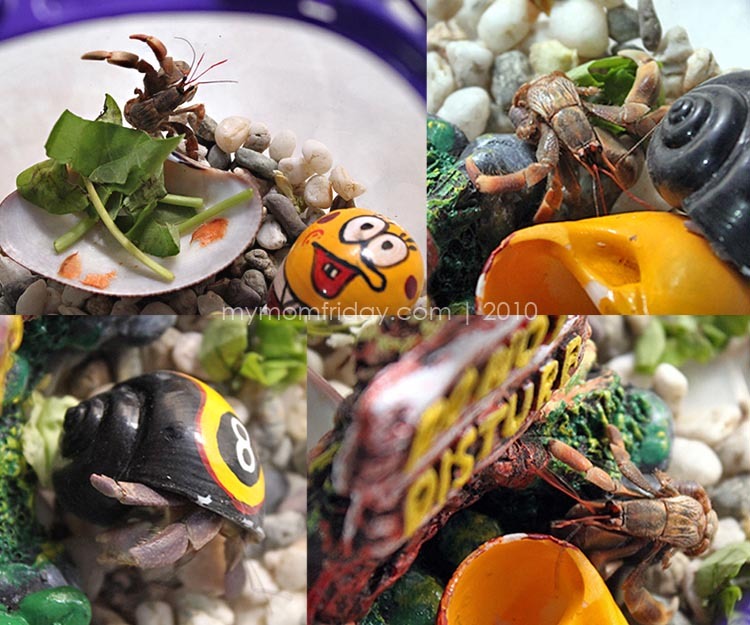 Caring tips for hermit crabs here. Wilson cor. P. Guevarra St.